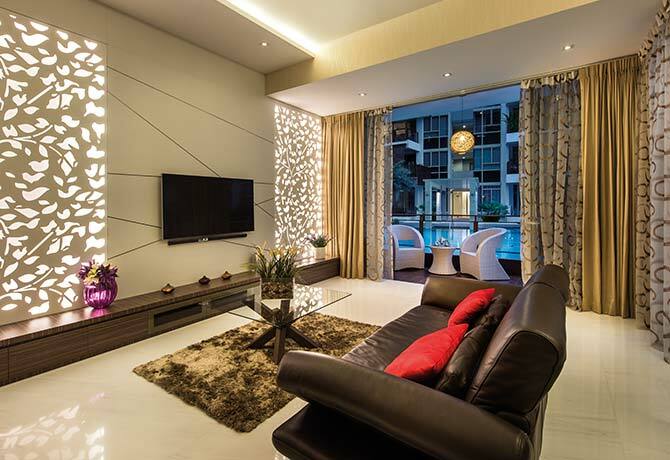 The couple and their three teenagers staying in this 4-bedroom apartment at The Floridian expected a certain standard of luxury when they engaged Wincy Tang from Rhiss Interior to design their home. On the family’s list of requirements was a contemporary design that is sleek and modern, with design features that would set the home apart from its neighbours. 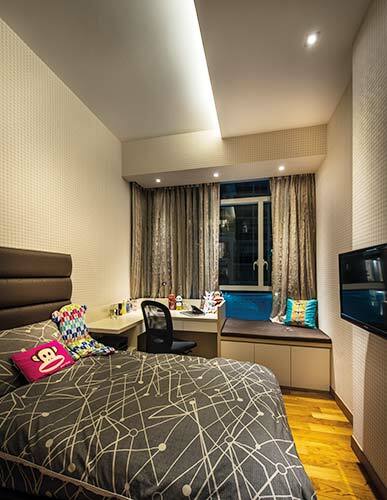 Wincy’s plan was to give the apartment a streamlined design but also imbue the rooms with a sense of luxury by using lights and customised design features. 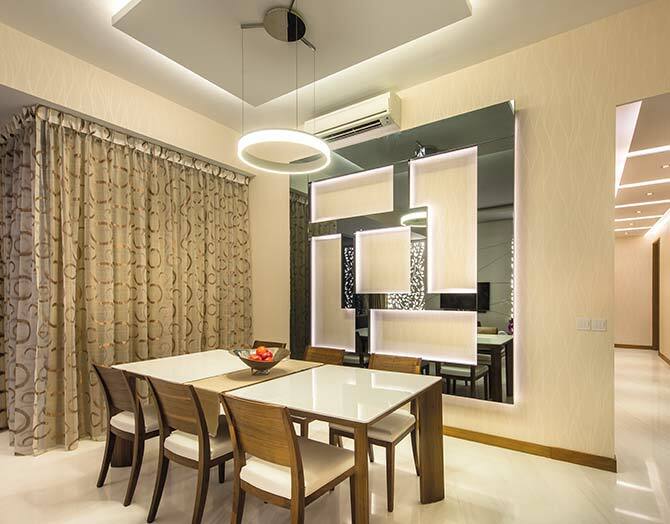 A mirror feature wall is common in many dining rooms, which explains Wincy’s decision to come up with something more unique. Inspired by “futuristic designs”, she created a geometric pattern made up of concentric shapes which made the feature piece an immediate focal point in the home. 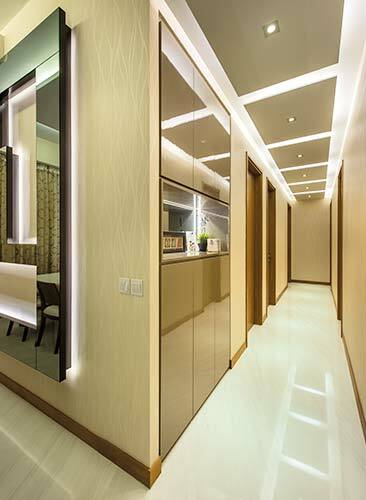 Complementing this is the use of LED lights that accentuates the feature wall. Most homeowners tend to neglect spaces like corridors and leave them bare or untouched. Wincy, however, wanted to highlight the walkway that leads into the bedrooms. A display shelf was built into the walls, immediately adding a bit of personality into the otherwise bland walkway. She also installed cove lights on the ceiling to soften the long expanse. Notably, the walls that flank the television panel in the living room feature a leaf motif that Wincy created by die-cutting MDF boards and giving it a spray paint finish. These boards are back-lit by strips of LED lights for a three-dimensional effect. When the main lights are turned off, these feature walls emit an alluring glow that throws beautiful shadows on the ceiling and floor. 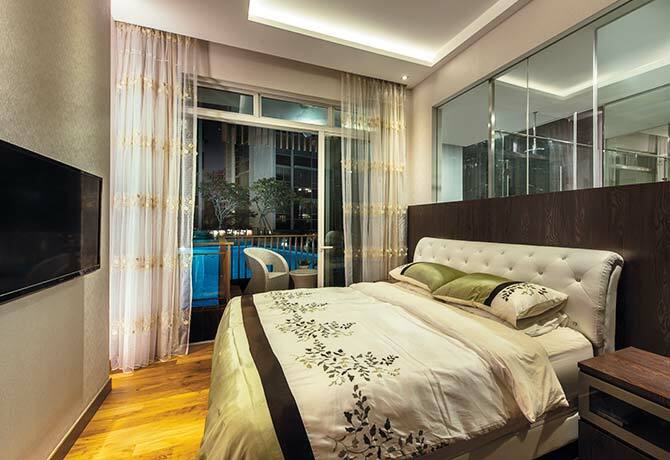 A large clear glass wall separates the master bedroom from the attached bathroom – an existing feature of the apartments in this condominium. The homeowners however, were uncomfortable with the lack of privacy. In response, Wincy created a built-in bedhead against the glass, ensuring privacy without having to replace the entire wall. 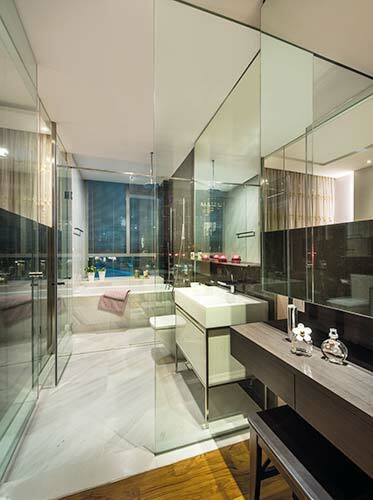 The spacious master bathroom is a thing of beauty, all decked out in glass and mirrors. Although the homeowners considered cutting down the floor size to enlarge the bedroom space, they decided against it when they realised how luxurious a roomy bathroom could be. Instead, the designers emphasized the room’s luxe factor with polished surfaces and flattering light sources. Each of the three teenagers staying in this home has their own room. Wincy wanted each room to be distinct but, at the same time, have a common thread running through the design. As such, each of the three rooms has the same basic design – cushioned headboards above the bed, cove lights on the bay window and a built-in study desk – but embellished with different accent colours for a spark of personality. Lookbox Living #39 is out now! Available at major bookstores and news stands.